We had a nice surprise recently in the form of a cheque for over £800 from the Kier Foundation, as part of the proceeds from their ‘where’s the bear campaign’. 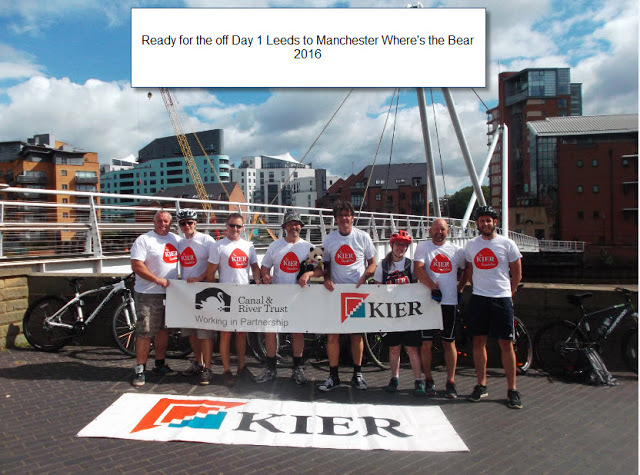 Nick Greenwood a friend of mine and Huw’s from football days took part in a leg of his employer’s challenge to travel 1,000 miles across Kier’s UK sites, transporting a mascot bear along the way and using only non-conventional, non-motorised transport! 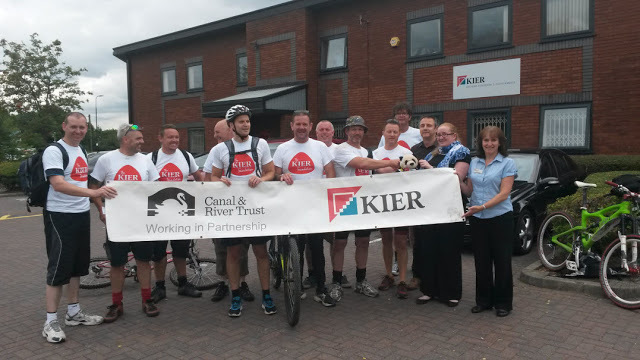 Nick and his colleagues cycled 80 miles over two days, on canal tow paths (with the bear) as their leg of the challenge and raised these funds in the process. I would like to thank Nick, his colleagues, and Keir Group for their contribution and everyone who sponsored them. It means a lot that Nick nominated the Huw Thatcher Trust as his local charity for these funds, which were raised in 2016. It was great to speak to Nick the other day and reflect on football days and some of the stories from those times; Nick was a co-coach with me and the others at Hepworth United for the other 15 year olds’ team. Huw loved turning out for Nick’s and James’s team on a number of occasions when he could get an extra game under his belt! I’ve seen a few of the football lads and their parents recently and reflected on those times. We always knew they were special times (although it didn’t always seem like it at training on wet winter nights) – but those times are even more special after what happened 6 1/2 years ago. On a related note it’s fantastic to see that Hepworth United now have a new clubhouse at the Far Lane ground. Dave Brennan (another former coach) has led the effort in great style to see this project through to completion. I’m looking forward to the clubhouse opening later in the Autumn and Huw would have loved seeing the club develop – and he would be very touched that so many of the footballers and their families think of and talk about him so fondly. But it’s easy to talk about Huw fondly – he was such a lively, talented, handsome and funny guy who goes on making people reflect and smile. Thank you so much to Nick and his colleagues for their fund raising and to Nick for some great memories. ← Six years after we started the Trust: over £110,000 to help brain injured people and to respect a perfect young guy.